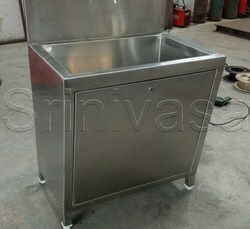 Prominent & Leading Manufacturer from Pune, we offer stainless steel plate wash basin and stainless steel hand wash basin. Being a customer-centric firm, we are manufacturing and supplying a wide range of excellent quality Stainless Steel Plate Wash Basin. We have manufactured the offered range of Stainless Steel Wash Basin in complete adherence with the international quality norms. These plate wash basins are available with us in various designs sizes and shapes to meet the various requirements of customers. We provide Stainless Steel Wash Basin.Washing of Utensils coming from DIning Area in 3 different water for perfect & Hygiene wash.
Owing to our expertise in this domain, we are manufacturing and supplying a broad array of superior-grade Stainless Steel Hand Wash Basin. Offered range of hand wash basins is manufactured by our experts in compliance with the industry laid quality standards & norms. Further, we are offering these hand wash basins in various sizes and other specifications to provide clients various options. These Stainless Steel Wash Basin can also be used as Hand Sinks.